It happens to the best of us. A—hopefully temporary—period of tiredness. A time of “ehhh!”, listlessness or mopishness. A state that tells us there is something bothering us and we should listen to what is going on inside: Is it caused by outside influences? Is it ourselves? Is it simply a sign of being stressed out? Is it a health-issue? It is important to talk about this in an environment where social media, society, and advertisement suggest that life has to be perfect all the time and we with it. Always glorious. Always happy times. A constant state of elation. Because, spoiler alert? Life isn’t like that. It is okay, normal, important, to have days like these. Or weeks. Or even months. During these times we need soulfood. It has to be made quickly. Easily. Almost without effort. Because—let’s be honest—especially in times like these we want it that way. Uncomplicated. We need these “almost no recipe” recipes. These “please don’t let me stand in the kitchen for too long” dishes. These “I’ll cook you every day, because everything else would be too bothersome” favourites. These “I just want to munch happily and feel good” meals, that go best with a glass of wine or a beer or a comforting pot of tea. 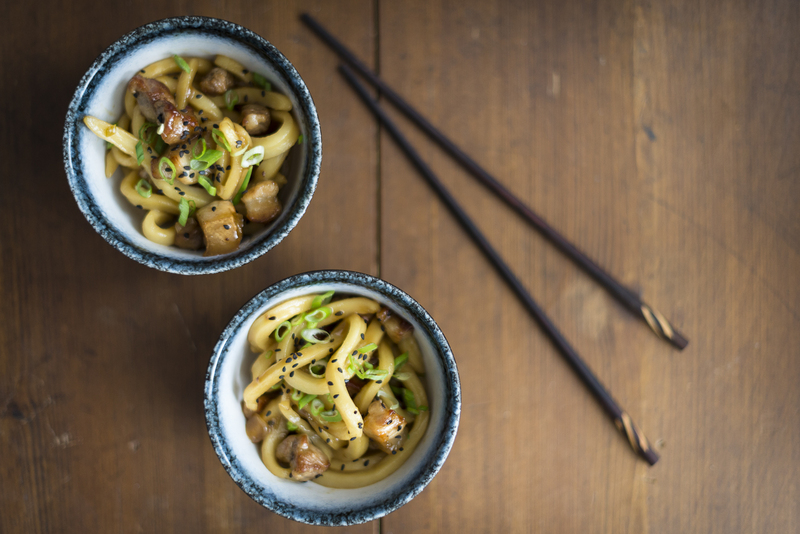 So what about udon noodles, quickly cooked and mixed with stir-fried pork belly? The noodles make happy just by being noodles and are always joyful to eat. The limes give a certain freshness and flavour, the pork is comforting, and the hot and sweet sauce will make us smile again. 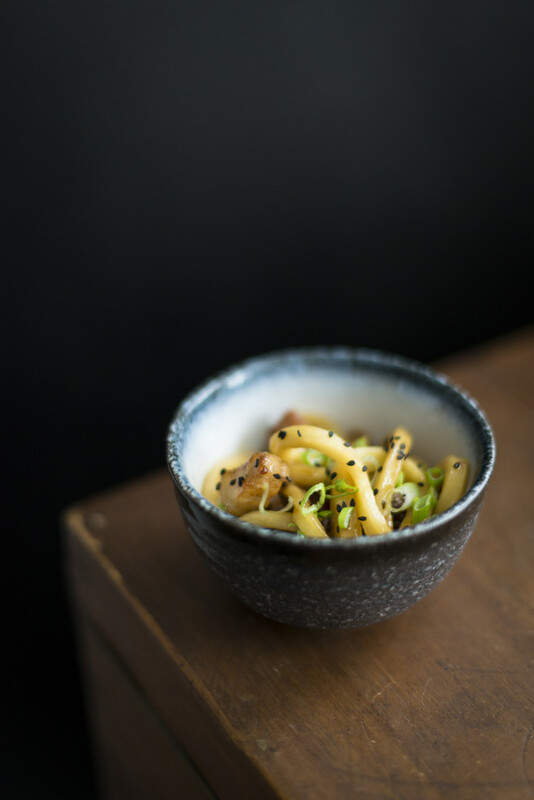 Of course you could make the udon on your own. But hey! There’s no need to always do everything from scratch when you can have it easy just as well. It’s alright. Live a little! Bring a pot of unsalted water to a boil, add the noodles and cook according to instructions. Drain them into a sieve and wash with cold tap water to rinse off additional starch and to stop the cooking process. Drain well and gently mix with a tbsp of oil. Pour the sesame oil into a pan and heat it up on medium to high heat. Mix the lime juice, honey, soy sauce and mirin. Put the pork into the pan and fry it until it looks nice and crispy all around. Shake the pan or stir every now and then. Add the white parts of the spring onions, the chili flakes, and the sauce and let it cook until it is reduced to a creamy consistency. Put the noodles into the pan, give it a good shake and divide the dish onto bowls. Sprinkle with the green part of the spring onions and some sesame. Serve hot and enjoy. *If you don’t want to make the udon on your own you can buy them just as well, of course. Personally, I prefer the precooked ones to the dried version. 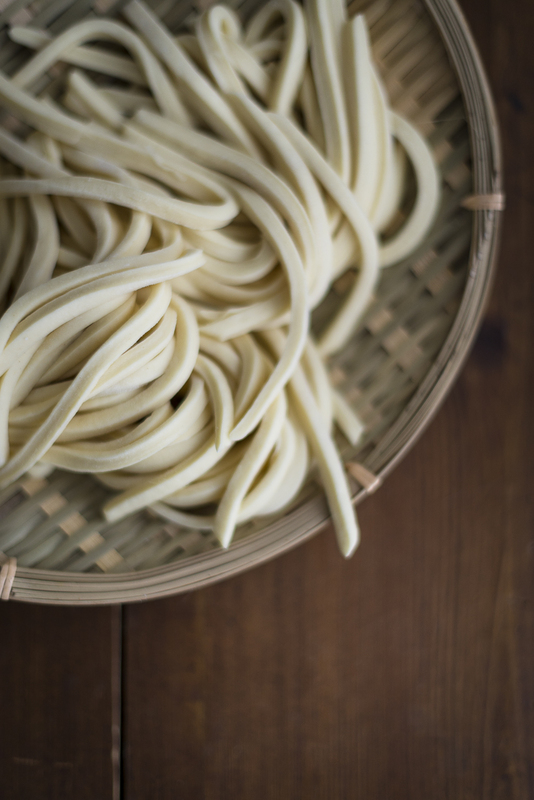 For the udon noodles knead the wheat flour with the water and the salt into a firm, smooth dough that’s neither wet nor too dry. Cover it and let it rest for an hour. Put the dough into a big plastic bag and put it into the floor to knead it with your feet for at least 5 minutes. Put it onto your work surface and roll it out until it is about 3 mm thick. Dust with a little bit of rice flour and cut it into 3 mm thick strings. Bring a pot of unsalted water to a boil, add the noodles and cook for 3-5 minutes. Drain them into a sieve and wash with cold tap water to rinse off additional starch and to stop the cooking process. Drain well and gently mix with a tbsp of sesame oil. Stored in a closed container and in the fridge the udon noodles will be good to eat for about two days.